Hyundai’s high-performance ‘N’ sub-brand will form the centrepiece of the South Korean company’s stand at the Frankfurt Motor Show. 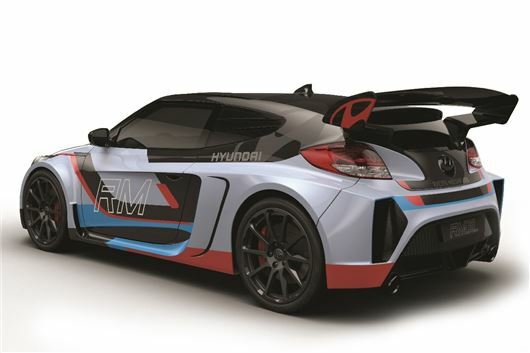 No production-ready models will appear, but the 2015 World Rally Championship i20 prototype and a Gran Turismo concept model are set to be displayed, along with a more road focused concept preview potential production models. Hyundai has yet to formally announce which of its models is to get the ‘N’ treatment first but the i20 would be a good bet, considering the current popularity of hot hatchbacks. Hyundai has also given the model plenty of publicity by running one in the World Rally Championship. Aside from the WRC car, the other big star on Hyundai’s stand will be the N 2025 Vision Gran Turismo concept car – a futuristic supercar concept (pictured below) that will be available to drive in the Gran Turismo PS3 game, but isn’t set to go into production. Finally there will be a high-performance version of the axed Veloster, powered by a 300PS 2.0-litre engine (pictured above). Called the RM15 concept, it’s been stripped back, with no rear seats, plus it sports some aggressive body styling including a huge spoiler. Considering the Veloster was canned in the UK due to poor sales, it’s safe to assume the RM15 won’t be going on sale.